Our treks vary from 1 to 12 days in which you mostly remain between 2900 m and 4200 m. The trekker must be confident that most walks have no tracks or paths and there is most of the time tented camping. The climate is unpredictable so you have to be prepared for sunny days, rain and cold nights. 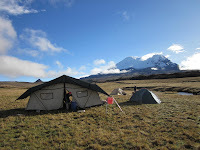 Our adventure trekking implies one or mor nights in tents, and our comfort trekking with all nights between trekking days in hotels, lodges or hosterias. 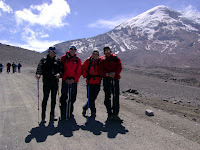 is considered as one of the highest active volcanoes in the world. Galapagos is one of the most incredible animal strongholds in the world today, but there is also much more to see. 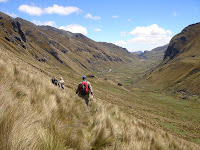 The Angamarca trek is located in a remote and less known area of the Ecuadorian highlands. 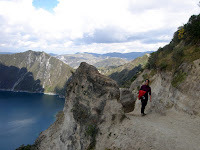 This trek takes us along the royal road that linked Cusco with the northern empire of Quito. 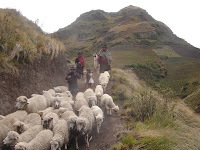 This trek in Northern Ecuador leads us to one of the most interesting areas of the northern highlands. This trek takes us to one of the most scenic and spectacular routes of the eastern cordillera. 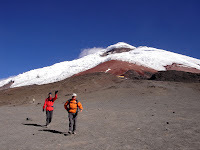 This trek is one of the most scenic walks in the Ecuadorian Andes, along the Abraspungo valley. 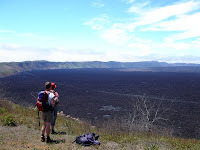 With its marvellous ragged crater, Altar is one of the most spectacular volcanoes of the Ecuadorian Andes. This trek goes through the most varied and interesting ecosystems of the highlands.